Fear for the worst has come to fruition. 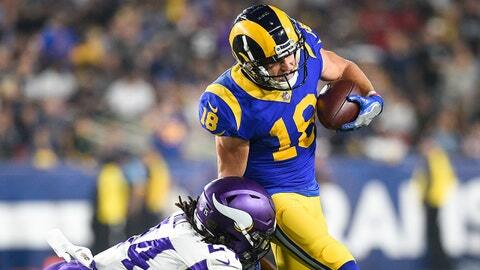 Los Angeles Rams receiver Cooper Kupp tore his ACL Sunday against the Seahawks, while Los Angeles Chargers linebacker Denzel Perryman injured his LCL and will likely need hamstring surgery as well, ending both players’ impressive 2018-19 seasons. In his second year, Kupp had hauled in 40 passes for 566 yards and 6 touchdowns before the injury, also marking his 100th career catch in Sunday’s game. Perryman was also proving to be a worthy contributor, with 51 combined tackles on the season. This would have put him on pace to break his season-high 73 combined tackles in his 2015 rookie year. The Chargers are sitting pretty with the third best record in the AFC at 7-2, giving them the first Wild Card playoff spot since the Kansas City Chiefs have them beat in the AFC West, and the Rams continue to have the best record in football at 9-1, destined for a high-seeded playoff berth. Both teams, however, will now have to continue without a key player. The Bolts will play host to divisional foe Denver Broncos Sunday, while the Rams will take on those very Chiefs on Monday night football in Mexico City.